Old Man Logan #45, by Ed Brisson, Juan Ferreyra, and Cory Petit, Logan and Joy finally catch up to Bullseye. Can they take him down before he kills again? So far, this story has captured the monstrousness of Bullseye and pitted it against Logan’s steely resolve. It’s nice, then, that this issue is a fitting conclusion to what has so far been a stellar story. Logan, Joy, and Shotgun chase Bullseye through the streets of Bridgeport, New Jersey, tagging him with a tracker before he escapes. After they catch up with him, Logan and Joy gain some crucial information that, thanks to the help of an unexpected X-Man, leads to a pulse pounding conclusion, as each of their resolves are tested in one final burst of violence. Brisson paces this issue perfectly. It begins with a high-speed car chase, chills out as Logan and company look for Bullseye, and then ramps it right back up for the ending. Working with Ferreyra, he delivers a lot of kinetic action, making great use of Bullseye and his ability in the car chase. For a scene like this to work in comics, it takes the right kind of script with the right kind of artist, and these two step up to the plate to present one that captures all the feeling of its big screen equivalent. It’s a great way to begin the issue, setting the pace for readers and getting them ready for the wild ride that this one takes them on. Brisson slows it down in the middle, giving Logan some time to impart some wisdom to Joy about the line of work she’s getting into. He tells her that this is a never-ending battle, and, if she’s okay with that, than go for it, while also telling her it’s a hard life to leave. Logan, in any incarnation, has always been the character to impart his wisdom on others. It’s a great little character interaction, the old warrior warning the young one about the perils of the life they’ve chosen. Brisson again makes a nod to Logan’s mentoring side with his interactions over the phone with Glob. Glob wonders aloud why Logan chose the pink bag of bones to investigate a kidnapping and Logan’s reply is simply that he did it because he knew Glob could handle it. It’s little moments like these that get across who Logan is and how, besides being a wrecking ball of a man, he’s also a teacher. Another example of Brisson’s gift for characterization is later in the book with Bullseye. Without giving anything away, Brisson has Bullseye do something that is terrible, yet completely in character for him. It’s chilling, but that’s the kind of monster Bullseye is, a sadist who enjoys playing with his enemies’ heads. Not enough good can be said about Juan Ferreyra’s artwork. He’s able to capture action in such a way that makes the reader feel like they’re there, while also delivering great figure work and character acting. 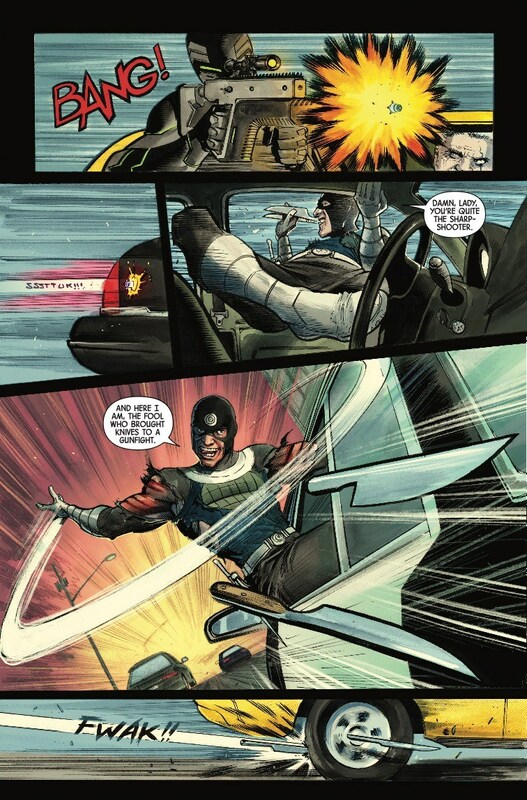 The beginning car chase is a pitch-perfect action scene, and he continues to kill it throughout the issue. Later, when things get heavy, he delivers with a lot of great character expressions and more visceral action. It feels like he was tailor made to draw this story. His art throughout this storyline is a large factor in how good it is. Other artists could have done a competent version of this one, but Ferreyra’s pencils and colors just made the whole sing. Old Man Logan #45 delivers a sense-shattering conclusion to what has been a stellar story. Brisson and Ferreyra have expertly managed to create an ending that elevates everything that came before it. This one packs powerfully realized action scenes with deft, sometimes subtle, character work into a wonderful denouement. There’s a lot to love in this one. It’s an embarrassment of riches.